We have been working on this new piece of ghost hunting equipment and would like to hear your thoughts on it. 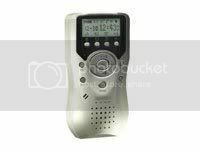 This product is a modification to existing digital voice recorders, which incorporates a headset that would allow the listener to hear the audio a few seconds after recording without stopping the recording. This enables investigators to be able to immediately respond to an E.V.P., creating better results and more direct communication with an entity. To watch a short animation for this device, click on the link below. For more information we have this being shown on inventionhome.com. Pics, video, and audio presentation are available there. You can view this product using the following infomation below.